I've been doing some more flora printing - the term I use for making plant prints on fabric. The last photo I shared (above) generated quite a bit of interest and a few questions, so I thought I'd make a little video to share my process. Not that it's complicated, but sometimes it's nice to see how someone else does it to give you the confidence and motivation to try it yourself. So, have a watch, tell me what you think and whether it's something you've had a go at. In the video I show a book cover that I've made with the plant printed fabric. You can find the tutorial on how to make the cover here. Above is the finished book cover that I started in the video and below is another (sorry about the distracting fabric it's lying on) plus some cards I made with the same technique. The book cover is really pretty! Wonderful video Charlotte.Love how this looks. Where do you buy your paints? 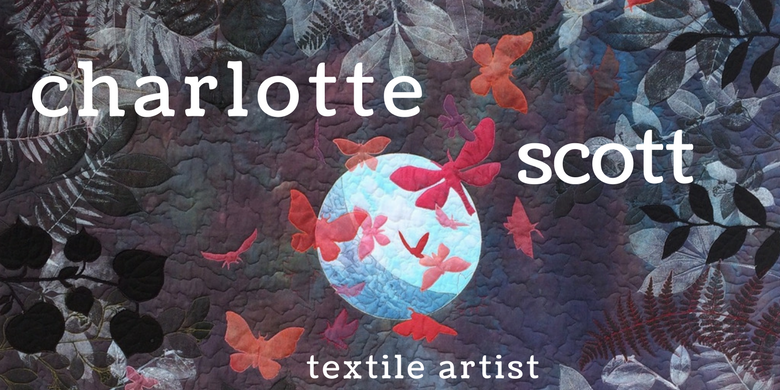 Great Charlotte - I now have an idea for Christmas presents! Good video.